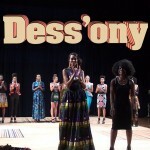 Dess’Ony catches the spirit of Africa in modern day fashion. With roots in Ivory Coast, designer Lilly Chou collaborates with talented local. Dess’Ony is about celebrating the beautiful and positive, in Africa and beyond.